Wellington, FL (April 4, 2012) – Dressage rider Caroline Roffman took home top honors at the $50,000 Florida Dressage Classic CDI-W at the Global Dressage Festival with her National Champion Pie, sweeping the small tour with wins in the FEI Intermediaire I with a score of 69.158% and the Prix St. Georges with a score of 68.737%. 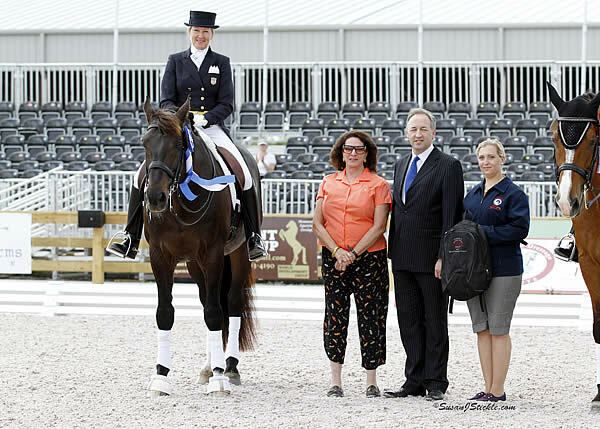 Roffman also rode away with the World Development Group Award for her small tour success, presented to her by the World Development Group, a premier developer responsible for building the Global Dressage Festival. Roffman and Pie are no strangers to the winner’s circle, having finished 2011 by winning 3 Reserve Championships at the Markel/USEF National Young Horse Dressage Championships at the Lamplight Equestrian Center. During the Global Dressage Festival, Roffman decided to step it up a notch with Pie, and the results proved to be positive. “We rode more forward and it paid off in the end. We had a few mistakes but Pie really stepped up to the task and showed me that he is brave, and that I can ride him more bravely,” Roffman said. Wellington, FL – April 1, 2012 – Rick Rockefeller-Silvia, a USDF Gold Medalist, scored the highest on the final day of the West Palm Beach National Show on Sunday. 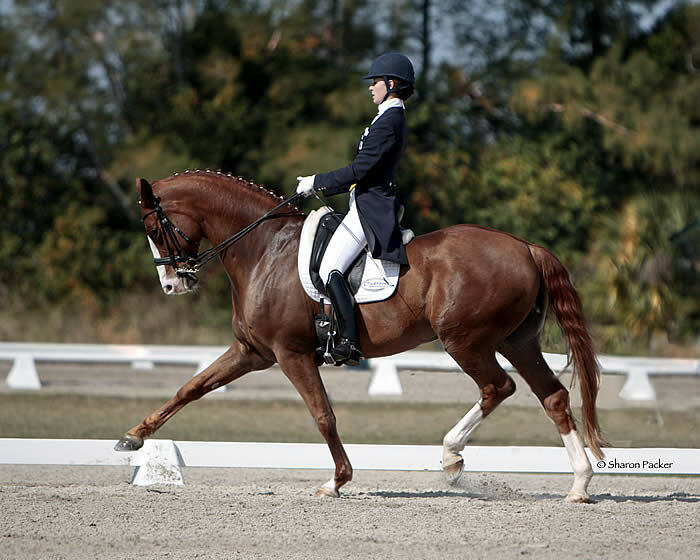 Riding Sakramenter, an Oldenburg gelding, the pair earned 79.595% in the USEF First Level Test 2 – Open at the at the Stadium show grounds of the Global Dressage Festival (GDF). The reserve high score winner was Tom Dvorak of Canada with Rubinio receiving 74.615% in the USEF Third Level Test 3 – Open. Megan Lane and Lucky Lemon scored 73.125% in the FEI Young Rider Freestyle and Aylin Corapcioglu and Ruhman earned 70.500% in the same class. Lisa Wilcox scored 72.125% on Sandro Welt in the USEF Fourth Level Test 3 – Open and she rode Pikko del Cerro HU in the USEF Developing Grand Prix to a score of 71.000%. Laurie Moore scored 71.667% on Rolero in the USEF Second Level Test 3 – Open, George Williams and Riccidoff received 71.486% in the USEF Fourth Level Test 2 – Open and Devon Kane scored 70.515% on Destiny in the USEF Developing Prix St. George. 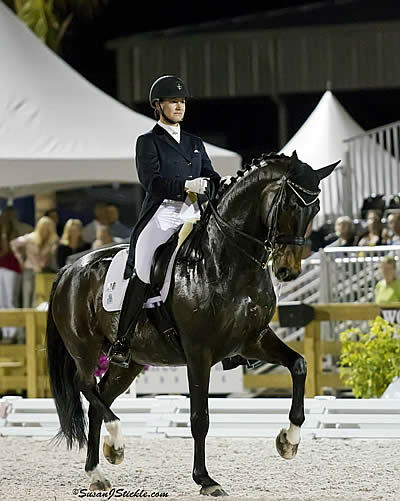 Wellington, FL – March 31, 2012 – Adrienne Lyle and Wizard returned to the stadium spotlight and danced away with the win in the FEI Grand Prix Freestyle during the Global Dressage Festival (GDF) at the $120,000 5* West Palm Beach, presented by Diamante Farms on Friday evening. Their score of 77.275% placed them well above the competition and earned prize money totaling $25,200. Ashley Holzer of Canada on Breaking Dawn was second with 74.000% and collectd $15,360. Anja Plonzke of Germany on Le Mont d’Or received 73.600% and $12,000 for third. Lyle, 27, an assistant trainer for Debbie McDonald at Peggy and Parry Thomas’ River Grove Farm, has the daily riding and training of Wizard (Weltmeyer-Pica, Classiker) and is very pleased with the way her charge is progressing. Wellington, FL – March 30, 2012 – Pierre St Jacques and his mount Lucky Tiger won the FEI Olympic Grand Prix Special in the $120,000 5* West Palm Beach, presented by Diamante Farms on Friday. St Jacques, who hails from Anthony, FL, took the blue ribbon with a score of 67.311% at the Stadium show grounds of the Global Dressage Festival (GDF). David Marcus, of Campbellville, Ontario, was second with Chrevi’s Capital scoring 67.022% and Christopher Hickey was third aboard Douglas Hilltop with 65.378%. Lucky Tiger, a 1995 Danish Warmblood gelding, is both owned and ridden by St Jacques. They have been a team since 2000 when St Jacques found Lucky Tiger in Denmark as a five-year-old. 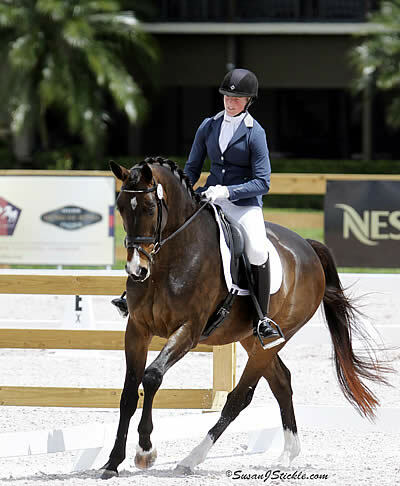 Wellington, FL – March 29, 2012 – Adrienne Lyle, 27, and Wizard took the top award at the Global Dressage Festival (GDF) in the FEI Grand Prix at the $120,000 5* West Palm Beach, presented by Diamante Farms. Their score of 73.021% placed them well above Anja Plonzke of Germany on Le Mont d’Or, who received 71.851% to come in second, and Ashley Holzer of Canada on Breaking Dawn with 70.957% for third place. Lyle works as an assistant trainer for Debbie McDonald at Peggy and Parry Thomas’ River Grove Farm. She and McDonald brought six horses for the Florida winter, among them Wizard (Weltmeyer-Pica, Classiker). Lyle was given the ride on Wizard because her height was a better fit with the gelding. “Debbie is tiny and Wizard is huge so she said, ‘Why don’t you try him?’ And we just clicked,” Lyle said of the 13-year-old Oldenburg gelding. 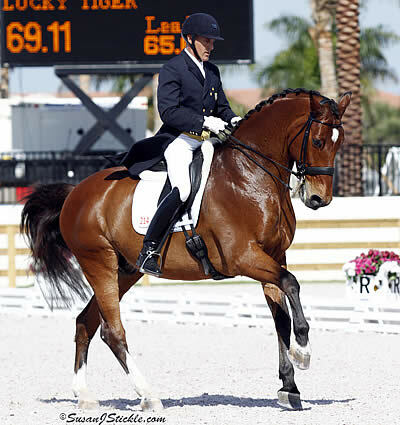 Wellington, FL – March 21, 2012 – Alix Szepesi of Hamilton, MA topped the leader board again at the Global Dressage Festival National Classic 2 on Wednesday, the second and final day of the show. Szepesi and William, owned by Margie Kelk, scored 75.541% in the USEF First Level Test 2-Open at the Stadium show grounds of the Global Dressage Festival (GDF). Szepesi was not even supposed to compete this week and was a late entry. William was originally slated to be a show jumper and showed exceptional talent, but he did not like Liverpool fences, so Kelk turned him into a dressage horse. 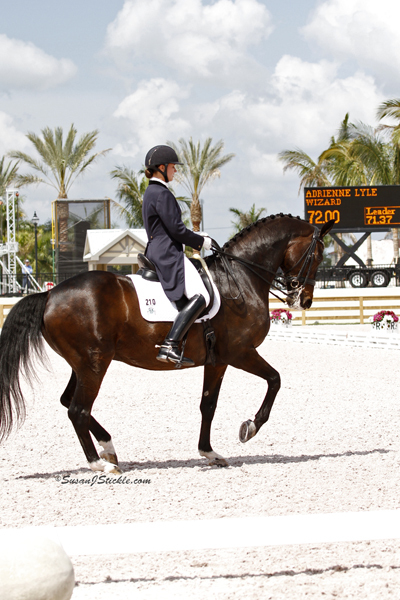 Wellington, FL – March 20, 2012 – Alix Szepesi of Hamilton, MA captured the high score of the day at the Global Dressage Festival National Classic 2 on Tuesday. Riding William, owned by Margie Kelk, Szepesi scored 74.189% in the USEF First Level Test 2-Open at the Stadium show grounds of the Global Dressage Festival (GDF). “William is a dream to ride in the ring. He gets really nice scores and he is fun to ride,” said Szepesi of the eight-year-old Dutch Warmblood. William was originally a show jumper, but he did not particularly like taking Liverpool fences, so his owner decided to try dressage. Wellington, FL – March 19, 2012 – The tenth week of competition at the 2012 FTI Consulting Winter Equestrian Festival (FTI WEF) concluded on Sunday. Sponsored by Artisan Farms, the week featured numerous exciting events, including the $80,000 Pennfield Feeds CSI 3* Grand Prix and $15,000 Artisan Farms Young Rider Grand Prix Final. Week eleven runs March 21-25 and features the USEF Selection Trials for the U.S. Show Jumping Team for the 2012 Olympic Games. The 2012 FTI Consulting Winter Equestrian Festival has 12 weeks of competition that conclude on April 1, 2012, and will be awarding more than $6 million in prize money through the circuit. It’s a Big Week at the FTI WEF Week 11 – See What You Can Watch! The Global Dressage Festival National Challenge is the next horse show at the Stadium show grounds of the Global Dressage Festival. The event takes place on Tuesday, March 20 and Wednesday, March 21. Come and watch top dressage competition in the beautiful new show grounds. Global Dressage Festival National Classic 2, Tuesday, March 20 and Wednesday, March 21 at the Stadium show grounds in Wellington, FL. The $120,000 West Palm Beach CDI-5*, presented by Diamante Farms, and National Show: March 29 – April 1. This prestigious event features the only CDI5* in North America this year and takes place at the Global Dressage Festival (GDF) Stadium show grounds in Wellington, FL. The FEI Grand Prix class will be held on Thursday, March 29 and the FEI Olympic Grand Prix Special on Friday, March 30 in the morning. The FEI Grand Prix Freestyle will be held on Friday evening. 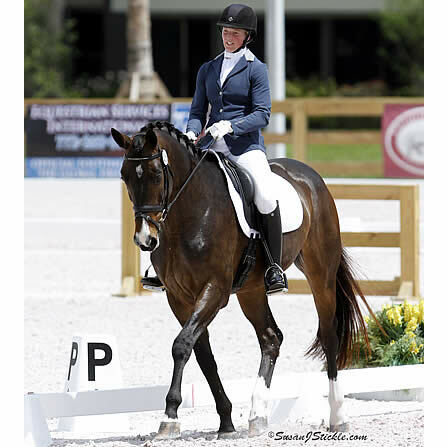 Wellington, FL – March 18, 2012 – Tina Konyot and her Calecto V scored an impressive 72.644% to take the FEI Olympic Grand Prix Special at the $15,000 Wellington Dressage Classic CDI***, presented by the Chesapeake Dressage Institute, held March 15-18 at the Global Dressage Festival (GDF) Stadium show grounds in Wellington, FL. Konyot’s competitive record proves she is a top athlete. She has been named to the USET Developing List, the USET Grand Prix List and short listed for the United States Olympic Equestrian Team. In 2010 Tina and Calecto V competed in the World Equestrian Games in Lexington, Kentucky. Steffan Peters and Anne Gribbons have been giving Elite Developing Clinic in Florida and California for the top horses and riders who may be in contention to be selected for the USA Team for the Olympics. Konyot took advantage of the opportunity to work with these two dressage greats.